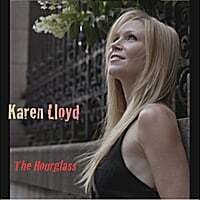 Check out Karen's new CD and labor of love "The Hourglass"! It's a powerful, expansive musical experience bound to take you on a wonderful journey! It conjures up a feeling reminiscent of yesteryear when Album rock took you on a 2 sided trip - a journey with peaks and valleys and creative adventures. You can feel Karen's love of Progressive rock, as it mingles with hints of classical piano, and memorable vocal hooks, delivering something altogether new and unlike any other female artist you've heard! All songs written, arranged, produced by Karen Lloyd mixed by Lou Gimenez at The Music Lab. Mastered by Scott Hull at Masterdisk. written, arranged, produced by Karen Lloyd mixed by Lou Gimenez at The Music Lab. In The End It's all about the LOVE BABY, YEAH!!!!! What's your religion where you livin' kind of car you own? I wrote the initial idea for this song immediately after President Obama was elected. Such an incredible moment of hope!!!!!! Life can be hard! It's a jungle out there! I wrote this song as a dedication to all of us who are often very hard on ourselves, and we're always worried and thinking, "Man - I should be doing more! - Achieving more!!!!!" - I guess it's trying to make the point that usually, if you take step back, you find that you're actually doing pretty well with it all, and maybe what we've all got going on right here and now already, ain't so bad. : ) The success is in the journey not the destination, right? She pours her coffee and heads to the office and wonders, "Where'd the time go?" It's amazing how one person can be such a huge form of shelter to us during the stormy hurricanes of life. Inspired by my shelter - the amazing Rick Kolster. When you listen to this you'll understand why it's the title track. nothing else could be, really, with this on the record! This was my biggest labor of love and the most musically self indulgent song in this collection. You won't hear a song like this on pop radio! ha! "The Hourglass" started as a classical piano idea which was the chorus progression and just kept unraveling into this very expansive and powerful tune that takes you on a real musical trip! This one was a lot of fun to craft, develop and bring to life... Lyrically, at the time I was somewhat influenced by what was happening in Afghanistan, but at the core of it - it's really a song about our humanity. Tell me where's the hope without the remedy? This song is dedicated to the awesome Lou Gimenez. As you may have seen, this record was mixed by Lou at his studio "The Music Lab", so you can imagine that we spent a great deal of time together. I believe in my heart that this record would not have the magic it does without his collaborative effort with me throughout the mixing process. But during many of our long days we had some awesome philosophical talks about life, family, relationships, etc. etc.... and one of those talks was the inspiration for this song. i literally went home one night after a session, and the next day this song just flowed out in one straight shot. It's a bit different production wise than the other material, but I felt it was an important song and the spirit of it made it belong with it's brothers and sisters in this collection. :) I would also like to thank Lou so much for his help in playing most all of the guitars on this one and helping me with his valuable production ideas that really gave this song the wings it wanted to have!